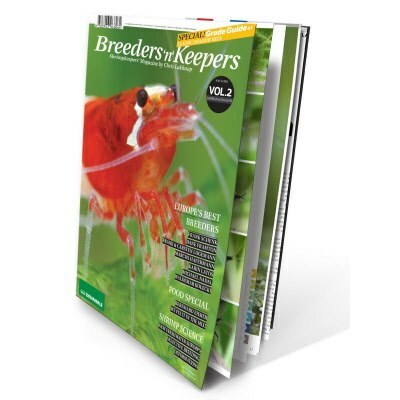 Fascinating breeder interviews and advice from experts is included in this second edition of Breeders’n’Keepers. 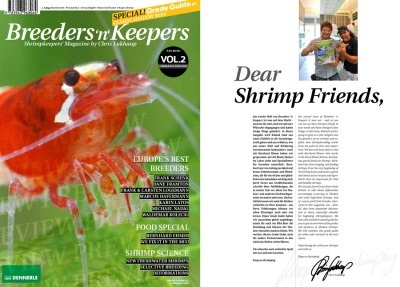 Roland Lück offers insight into shrimp genetics, and Bernard Ehmer, the expert in secret recipes and cures that are indispensable for an active and happy shrimp life, has information about shrimp nutrition. Then there is Jared Green from the United Kingdom on the subject of abnormal development in shadow shrimp and other high-grade shrimp, and Werner Klotz also adds his viewpoint. Obviously, we also let the breeders have their say - rookies can especially benefit from learning about their experiences. Furthermore, there is a grade guide to the classification and classes of shadow shrimp. The articles appear in both English and German. On the whole, this is a great package of intriguing information interspersed with close-up photographs of spectacular examples. Keep on shrimpin'!